Last summer I was lucky enough to attend the opening of a photography exhibition of work by none other than the Italian actress and authentic living legend Gina Lollobrigida who has been a keen photographer for many, many years. I remember noticing a photograph that she had taken of Soviet cosmonaut Yuri Gagarin, so I was particularly pleased to come across this 1969 postcard of the two of them together - the Italian diva's camera is prominent in the foreground of the image! 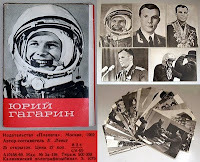 This vintage uncirculated postcard was issued as part of a pack of 25 souvenir cards illustrating moments in the life of Yuri Alexeyevich Gagarin in the year following his premature death at only 34 after his pane crashed during a routine training flight. On 12 April 1961, he had became the first man to travel in outer space and the first to orbit the Earth. 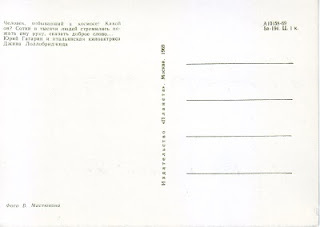 Appropriately, the name of the Moscow postcard publisher in the Soviet Union translates as “Planet” (Disclaimer: I'm putting all my faith in the results of Google translate here!) The postcards are printed, rather than real photographs, but the entire pack is still a lovely item. A man who had been in Space! What's it like? 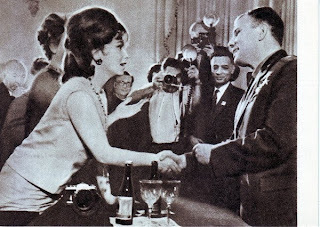 Hundreds of thousands of people wanting to shake his hand, to say a kind word ... Yuri Gagarin, and the Italian actress Gina Lollobrigida. If any of you read Russian please feel free to correct this translation in the comments below! Very cool postcard. Captures so many aspects of that era! Wow, very cool postcard...and your translating efforts are impressive. What a great find! Who would have thought we could see Yuri and Gina in the same picture! BTW when I go to a baseball game I spend all of my time watching people and lose complete track of what's going on in the game. Great postcard of 2 icons of that era. That's a keeper. It seems such an age ago now, and space exploration has progressed so much since. So sad that he died so young. That's an interesting set of postcards. I didn't know Gina Lollobrigida was a photographer. I can't seem to find photos by her online, just photos of her. 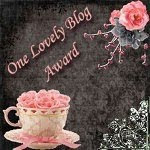 I just had to click on the link on Marie's page - Gina and Yuri, such an odd couple! 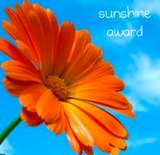 Happy PFF and thanks for sharing. I'm a space nut -- but if I had a choice, I'd have opted to shake Gina's hand over Yuri's.